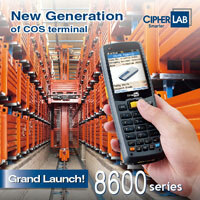 CipherLab Presents the New Generation of COS Terminals - CipherLab Co., Ltd.
Taipei, Taiwan - January 24, 2014- CipherLab, an established innovator in Automatic Identification and Data Capture (AIDC) is very excited to introduce the 8600 series mobile computer with the CipherLab Operating System (COS). Running on COS, the 8600 series focuses on typical AIDC applications that are specific to the company's needs. It is equipped with a color display facilitating data classification by preferred colors. Its flexible designs include swappable keypads of 29 or 39 keys that can be switched when the users see fit. Weighing only 240 grams, the 8600 series allows for comfortable usage with excellent mobility. The 8600 series also comes with proven WLAN 802.11 b /g / n and the latest Bluetooth® 4.0 that efficiently deliver real-time data transmission. Versatile reader options of linear imager, laser, 2D imager and option RFID allow for favorable fashions of data collection. Along with easy-to-use software tools, such as Forge Application Generator, Remote Console and Text Browser, the 8600 series facilitates easy startup and provide more efficient IT management. The device is also extremely rugged with IP65 standards, capable of enduring exposure to dirt, water jets, 1.8 m drops and 1,000 tumbles at 1 m. Keeping the demanding needs of warehousing & distribution center and manufacturing industry in mind, the 8600 series fuses functionality, ruggedness and mobility altogether. "With all of the features of our 8600 series, the new generation of COS terminal, I'm confident that our users will feel the efficiency and increase productivity right away. It is light weight, yet rugged and powerful." President of CipherLab, Steven Liau stated. The 8600 series mobile computer is definitely a new generation product for the better future. For more details and specifications regarding CipherLab 8600 mobile computer or other CipherLab products, please visitwww.cipherlab.com.